It’s Tortoise’s birthday, and we’ve been invited to the surprise party. Hare’s task has been to decorate the burrow (check), set the table (check), and hire a chef to cook the birthday feast… Oops! As usual, hyperactive Hare has been too busy bouncing around the place to finish working her way through the to-do list. ‘No problem!’ says Hare. ‘I’ll call Pizza-Hutch!’ But if there’s one thing Tortoise hates more than Hare’s unreliability, it’s junk food, so he’s going to cook instead. Although, him being a tortoise, that might take a while… Luckily, ever-practical Bird is on hand with a bright idea: if we all work together, we can use produce stashed around the burrow to create a delicious three-course meal in a fraction of the time. But will the healthy option arrive before the pizza? 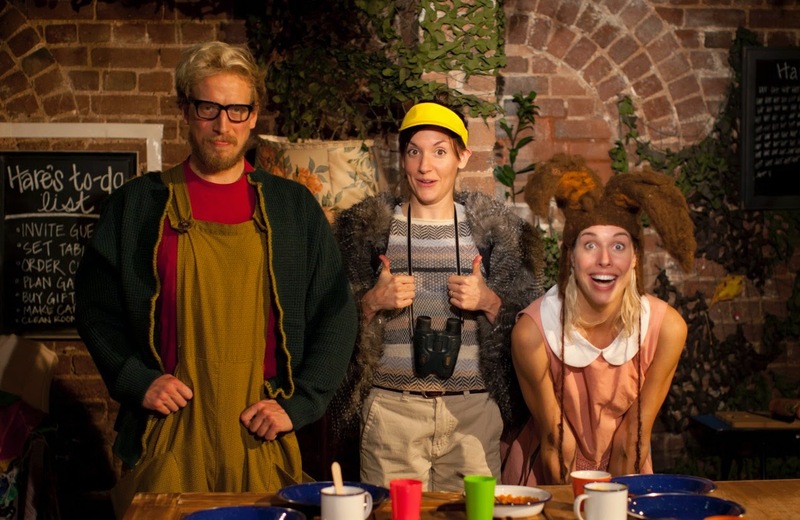 The first production from Exeter-based company Aminal, this interactive kids’ show is a delight from start to finish, fusing fun storytelling, hands-on food preparation and three cracking comedy performances from devisors Jonny Rowden (Tortoise), Kelly Mare Miller (Hare), and Katie Villa (Bird). 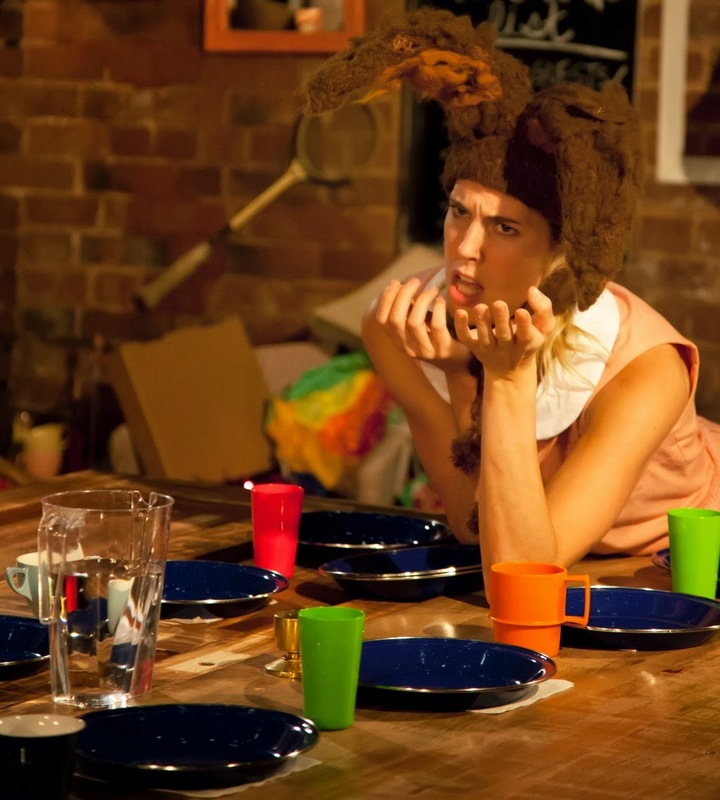 As we all gather round the giant table – made out of doors, some still with knobs attached, it’s just one of the many highlights of Laurel Coxon’s genius make-do-and-mend-style set and costume design – the narrative blends past and present to reveal the origins of Tortoise and Hare’s chalk-and-cheese relationship and the burgeoning niggles that are threatening to up-end life in the burrow. Can fun-averse Tortoise and harum-scarum Hare ever come to recognise each other’s good points, and live in mutually appreciative and collaborative friendship ever after? While loosely working with Aesop’s central tenet – slowly but surely wins the race – the piece also seems keen to draw attention to the importance of making healthy food choices: Hare, it’s implied, is constantly hopped up on E-numbers, the many naps she falls into presumably a result of sugar crashes. And although this element feels a little underdone, that might be the point – nothing is bound to put kids off vegetables more effectively than a bunch of adults banging on about how good they are for you, not even if that adult is wearing a huge crocheted shell – but it’s also impossible to be anything but utterly beguiled by Hare, who is so rambunctiously appealing that Tortoise is in danger of losing the popularity contest outright. Whatever the educational intent, this is a great kids’ show – engaging and upbeat, cute yet smart, and with enough shifts in action and immersion to keep short attention spans focused. If the pace slips a little on occasion, it’s barely noticeable, and all three performers are adept at keeping even the youngest audience members on track, plus there are plenty of funny quips and asides to keep Mum and Dad giggling too. Let’s hope Aminal get the chance to put on a Christmas show at some point. I bet it would be a blast.